Is The Reviber Fusion Vibration Plate Exerciser A Step Up From Basic Models? The Reviber Fusion Oscillating Vibration Plate Exerciser is an interesting prospect for anyone that is on the fence about the type of vibration plate that they want. This bulky, powerful model looks like a more intense option than the cheap and cheerful portable plates. The accessories add to this appeal. Still, it is more user-friendly and smaller than the massive gym-ready options. Is this the ideal middle ground? The Pros and Cons of this Reviber Fusion Vibration Plate. 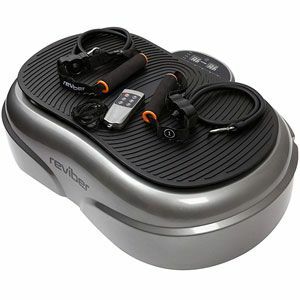 There are lots of great features to this Reviber Fusion Oscillating Vibration Plate Exerciser within a sturdy machine. Users can get a pretty good workout here. There is a great vibration from the powerful plate and its 14mm oscillating amplitude. This is higher than that of some competitors, so should offer a greater motion. It also comes with bands that allow for muscle toning in the abdominal region and arms. This means there is plenty of room for other exercises and for users to target problem areas. The additional DVD and workout poster adds to the appeal. Many users also impressed with the quality of the machine. There is a good build here on a large, but overly large machine. Many appreciate the sturdy feel, good connections and quality control, good clips on the bands so they don’t go flying off during an intense session. Even so, this is still a compact, sleek machine. In fact, some say it is smaller than others they have tested previously. This is all helped by the high weight capacity of 200kg and the use of a steel base, rather than the plastic of leading competitors. There is a lot going on here with this Reviber Oscillating Vibration Device, which means that the remote control could be more reliable. Criticisms are rare with this product. However, there are some that feel that the remote control is a little temperamental. This can be an issue when relying so heavily on a smooth transition and optimal routine on a powerful plate. The plus side of this remote is that it is on a lanyard, so offers a hands free approach during those cardio sessions with the bands. There is the sense here that perhaps there is too much to think about for those not used to these types of machines. Complete novices may struggle. What does this all means for a final verdict on this Reviber Fusion Plate? It is hard to criticise this product too much because it offers so much to users. 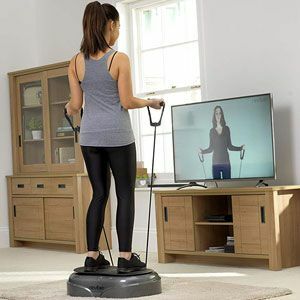 The amount of workout options and the intensity of the vibration are great for those that want to go further than the usual vibration plate sessions. This does mean that this is arguably geared more toward the more experienced user than first timers. Perhaps with a new remote control this could be the ideal machine to upgrade to when building on bigger workout goals. As it is, this Reviber vibration plate still has a lot of potential for many users. Find more reviews about the Reviber Fusion Oscillating Vibration Plate on Amazon here.